I have been searching for a great Healthy Instant Pot Chicken and Rice Recipe. But not just any recipe. I wanted one that was full of flavor and kept me coming back for seconds. We have used our stackable inserts to make a basic chicken and rice recipe. But this time I was looking for a complete, one pot meal. One that I could make right in the liner of my Instant Pot. A plate of Healthy Instant Pot Chicken and Rice. Almost every recipe that I found online didn’t appear to be healthy at all. Several of the ones that I found included condensed cream of mushroom or chicken soup. I am pretty sure, that there are healthier options than those processed soups that are filled with sodium! So I kept looking and was shocked at what I found. 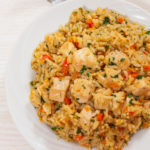 Other healthy instant pot chicken and rice recipes added either sour cream, cream cheese or shredded cheddar cheese after the cooking process ended. 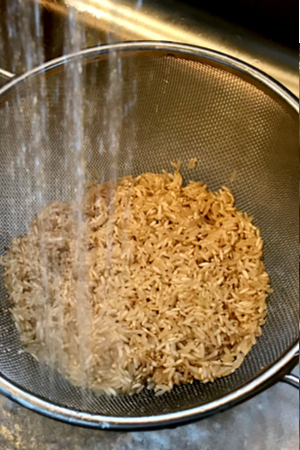 Any time you make rice, be sure to rinse it until the water coming out of the bottom runs clear. Yes, I know that I could have eliminated that step. But I figured if the original recipe called for that specific ingredient, than it was needed. All I wanted was a great tasting, healthy Instant Pot Chicken and Rice recipe. And one that I could make as a one pot meal. So I went to the drawing board and experimented with a variety of flavors until I perfected the BEST Healthy Chicken and Rice dish. Because both chicken and rice are very bland in nature, I knew that I would have to use a variety of spices and seasonings. Red onions and red peppers sauteing in the Instant Pot. I wanted a true go-to chicken and rice recipe that we would make over and over again. 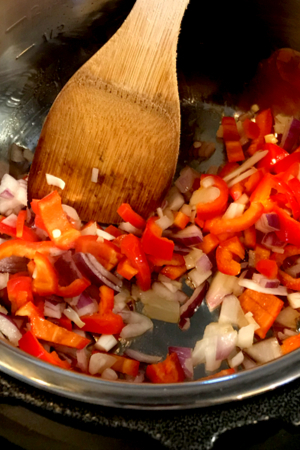 The first layer of flavor begins from sauteing red onions and peppers right in the liner of the Instant Pot. Be sure that the Instant Pot display reads HOT before adding any oil to the pot. This will make sure that it is heated well enough and prevent items from sticking to the bottom of the liner. Toasting the dry spices brings more flavor to the dish. 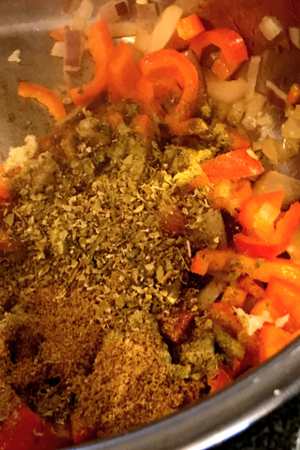 Once the peppers and onions have become slightly tender, the garlic and dry seasonings are added to the hot pot. Sauteing the dry seasonings helps to release the flavors at the beginning of the recipe rather than waiting for it to be heated during the actual cooking process. And instead of using water to cook your rice, we always prefer to use chicken stock. But one word of caution, if you don’t make our own chicken stock be sure to purchase the low sodium variety. The salt content can be a little too much in standard store-bought chicken stock. You can add a variety of vegetables to this dish. Pictured here are carrots and mushrooms. You can always add additional salt when you are ready to serve this Healthy Instant Pot Chicken and Rice. But most often, I end up adding fresh ground pepper and maybe a few hot pepper flakes to my plate! Every time we make this recipe, it is a little different. Not because the recipe changes, but because of what we have on hand in our kitchen changes. Not to mention, there are some picky eaters that sometimes have dinner with us. So of course, I try to accommodate everyone’s likes and preferences. The chicken stock is the last thing to be added to the pot. Sometimes we will omit the mushrooms and add in another vegetable instead. We have added broccoli and even cut up asparagus spears to this recipe to get a little more green in our diets. And after the recipe has cooked, we will add in a handful of spinach, frozen corn and/or peas for another chance to eat those veggies. 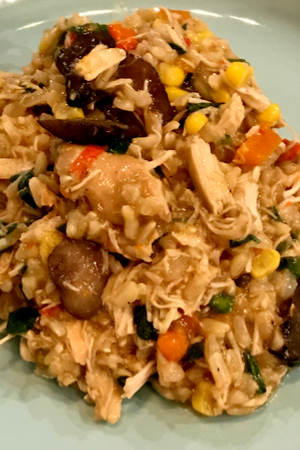 But my favorite thing of all about this Healthy Instant Pot Chicken and Rice dish – you can make it the way you like it! Once the cooking time has expired shred your chicken and add in frozen corn, spinach or peas. And yes, that includes adding in a little unhealthy ingredients once in a while. It’s all about moderation, right? 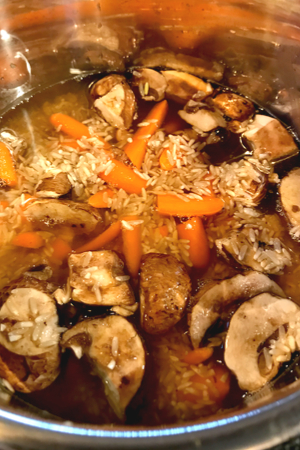 Delicious and healthy chicken, rice and vegetables one pot meal made in the Instant Pot Pressure Cooker. 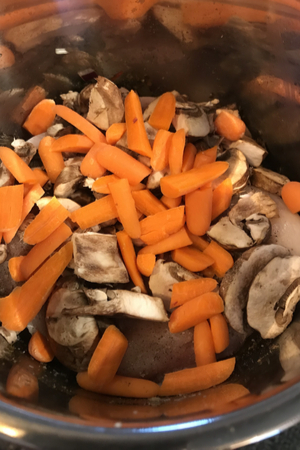 Turn Instant Pot on Saute. Once the display reads HOT, add the olive oil, onion and red pepper. Saute for 4 minutes. Add garlic, thyme, cumin and oregano to the pot and saute for one minute. Turn Instant Pot Off/Cancel. Add ¼ cup of chicken stock and deglaze the pot. Add chicken to the pot and season with the salt and pepper. Place mushrooms and carrots on top of the chicken. Pour Worcestershire sauce over top. Add the uncooked, rinsed and drained long grain brown rice to the pot. Do not stir. Add the remaining chicken stock down the sides of the pot and press any rice grains into the liquid. Place the bay leaf in the liquid. Close the lid and place valve in the sealed position. Pressure Cook/Manual on HIGH pressure for 22 minutes. When cooking is complete, allow the Instant Pot to natural pressure release for ten minutes. Then manually release any pressure. Remove the bay leaf and discard. Remove the chicken breasts and shred. 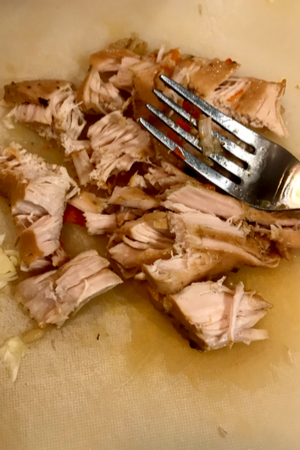 Return the shredded chicken back into the bowl of the Instant Pot. Optional – add julienned spinach, frozen corn or peas. Replace the lid and keep warm for 5 minutes. Open lid and stir. This recipe has been tested in both the 3 quart and 6 quart Instant Pots. As always, remember there is additional time needed for the pot to come to pressure before the actual cooking time begins. We are so glad that you enjoyed it as much as we do!